Hi everyone, we know a lot of people have been asking about the Switch release date, so we're pleased to finally confirm that RiME will be releasing on the Nintendo Switch on November 14th in North America, and November 17th in Europe. We'll be releasing a producer's letter from our Lead Producer, Cody Bradley, next week to give a bit more insight on the process of developing for the Switch. In the mean time, feel free to check out the FAQ on our forums. What is the release date for the Switch? The release date for the Nintendo Switch version of RiME is November 14 in North America, and November 17 in Europe. Why is there a difference in release date for North America and Europe? The three-day difference is due to the retail environments present in both territories, particularly during the holiday season. What was the reason for this delay? Development on the Switch version of RiME began after development on the other versions. Fans who have been waiting for the Nintendo Switch version have been among the most patient, and so Grey Box and Tequila works wanted to make sure that the version of the game they received was in as strong a state as possible. The additional time was spent towards optimization for the Nintendo Switch. What will the Switch version cost? The digital eShop version will cost the same as the previously-released versions of the game, at $29.99 / €34.99 / £29.99. The physical edition, which comes with a soundtrack download code, will retail for $39.99 / €44.99 / £39.99. Why does the Switch physical version have a higher price than the other versions? 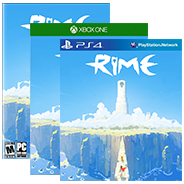 The physical version of the Nintendo Switch version of RiME has a price which is based upon the development and manufacturing costs necessary to bring a product to market on the platform. In order to accommodate for this price discrepancy, a redemption code for a digital download of the RiME Deluxe Soundtrack by David García Díaz. The Switch digital version will be priced equivalent to the other versions of the game. Do I get anything different for buying the game on Switch vs. other consoles? Are there any significant differences in in-game content? At the moment, the experience on the Switch is the same as on other systems, though with the added freedom to take the adventure anywhere using the Switch’s portable functionality. Additional information will be provided as we approach the release date. Will the pre-order incentive map still be provided to people who pre-order? For those who pre-order the physical version from participating retailers, the pre-order incentive will be provided. Retailers who provided the map for the initial launch will do so for the Switch launch. Be sure to check with your preferred retailer. WHAT.....NO MAP????? All three retailers(BestBuy, GameStop and Amazon) no longer state that the switch version will come with the map as a preorder bonus!!! I WANT MY MAP!!!!! Lol.